C to D is one whole step or tone due to the black key in between them. E to F is one half step or semitone there are no keys between them. The Major Scale can be thought of as - whole step - whole step - half step - whole step - whole step - whole step - half step. 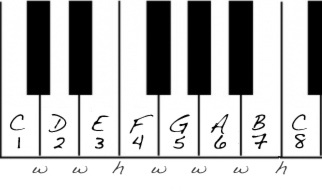 Another way to think of the major scale notes is as numbers - the first note C=1 and the second note D=2 and the third note in the scale E=3 and so on. Please have a look at Diatnic Harmony to see how the numbers way is the best in the end.